English3's E3J1 Interview was built in partnership with institutions concerned with increased scrutiny of J-1 exchange visitors and expected greater enforcement of the English proficiency documentation requirements. 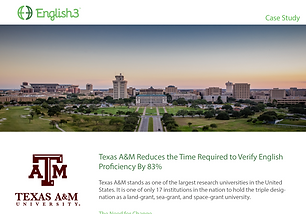 Eliminate logistical challenges and consistently verify J-1 visitors’ ability to participate in their program and to function on a day-to- day basis with a solution built exclusively for the J-1 English needs of institutions. Why Choose the English3 J-1 Interview? No other solution provides adequate convenience for international offices, sponsoring departments, and visiting scholars. 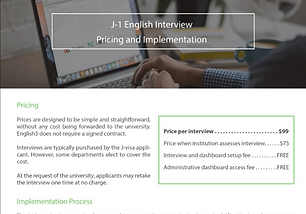 Using proprietary technology, the E3J1 Interview ensures that the applicant has the English required to fulfill the purpose of the exchange visit. The interview includes questions about day-to-day interactions, cultural exchange, and safety, as well as beginner, intermediate, and advanced general questions. 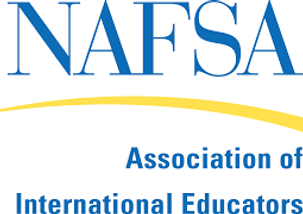 8 out of 10 scholars surveyed prefer the English3 Interview over other solutions, even free solutions such as Skype. 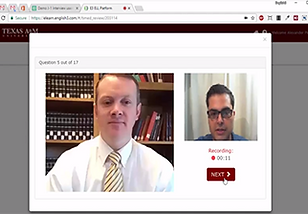 Scholars love that they can complete the interview anytime, anywhere, and in under 25 minutes. 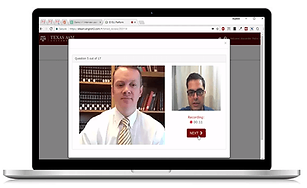 Easily record, forward, or download applicants’ scores and interview videos. English3 scores also integrate with record management software, reducing administrative tasks needed to verify English proficiency. Customers come first at English3. English3 has a perfect Net Promoter Score—100% of our customers would recommend the E3J1 Interview to other institutions. 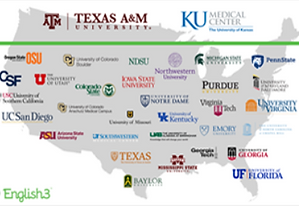 We'll connect you with institutions similar to your to discuss their experience.